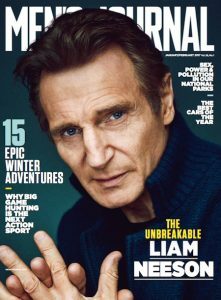 This New York-based consumer magazine focuses on men’s health, fitness, gear, adventure, lifestyle, outdoor culture, and travel destinations. 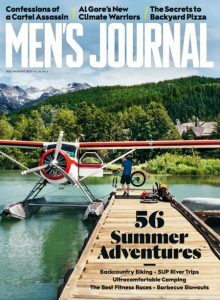 Target audience: The Men’s Journal audience is primarily made up of readers who are sociable, tech-savvy, health-conscious, and interested in outdoor culture. Sporting an average household income of $155,155, readers are primarily affluent and motivated professionals that express a keen interest in fitness, adventure, style, and leisure. Eighty-six percent of print readers are male, and 14% are female. They primarily own homes, which have a median value of $485,932. Sixty-five percent of readers range between the ages of 18 to 49. 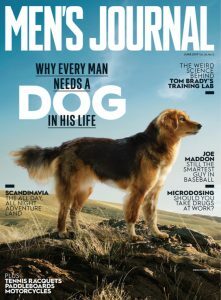 In terms of a digital presence, market research has shown readers are heavily invested in mensjournal.com, primarily for its guides, tips, and original video. The website boasts an audience of nearly 5 million, and has seen more than 130% growth in unique visitors since December 2014. Front of book sections: “Notebook” which contains “Travel & Adventure,” “Dispatch,” “Food & Drink,” “Off Duty,” “Grooming,” “Style & Design,” “We’re with Her,” “Seal of Approval,” a photo, and one or two further uncategorized articles. Features: There are three features per issue. There are no pre-established categories. Editorial staff are responsible for “Fitness,” “Grooming,” “Seal of Approval,” the features, and “Advice.” The food articles in “Food & Drink” and “Off Duty” are written by regular contributor Adam Erace, “Style & Design” is written by regular contributor Justin Fenner, “We’re with Her” is written by regular contributor Sarah Z. Wexler, the photo article in “Notebook” is written by assistant editor Josh Ocampo, and “The Last Word” is written by contributing editor Sean Woods. “Travel & Adventure” contains about two articles covering travel to destinations worldwide, itineraries, news and events in 1,000 to 2,000 words. Travel-focused articles are usually written in a first-person narrative style or in a second person voice. News and event pieces are usually written in third person. Quotes or dialogue are found throughout both types of articles. There are sometimes one or two sidebars to accompany the article. This could include how to get there, where to stay, or tour companies with relevant websites and prices, for example. Examples from recent issues include “Argentina’s Route 66,” which covers the writer’s trip to Salta to road trip on Ruta 44 through the country, “West Texas’ Swing,” which covers a four-day itinerary for driving through west Texas, and “American Alpine Tragedy,” which covers the death of a prominent mountain climber. *The food articles in “Food & Drink” and “Off Duty” are written by regular contributor Adam Erace. In about 400 words, these can appear as a round up of recipes or a profile of a chef on their cooking and eating habits. There is usually one drink article found in “Food & Drink” which covers alcoholic drinks such as spirits, wine and cocktails. This could appear as a round up of drinks to try, cocktail recipes, or an article covering a story or trend. In 400 to 1,000 words, the article is written in third person and sometimes includes quotes from those involved, such as bartenders or managers. Recent examples include “Grape Expectations,” a round up of different wines for readers to try, and “Doubling Down,” which covers cocktails including two of the same spirit, such as two complimentary brands of vodka in the same drink plus three recipes to try. “Grooming” is a 200-word article covering grooming and skincare topics for men. These usually appear as a third-person round up describing five products with a short description and the price for each. Recent examples include “The Secret Sauce,” which rounds up five serums, and “Mask Appeal,” covering five different face masks. *“Style & Design” is written by regular contributor Justin Fenner and covers menswear fashion in about 200 words. This usually features a round up of products with how to wear advice. *“We’re with Her” is written by regular contributor Sarah Z. Wexler and takes the form of a profile. Articles are about 800 words long and appear as Q&As with well-known female celebrities covering their careers, personal life, and future projects. *The photo article in “Notebook” is written by assistant editor Josh Ocampo. This features a double-page photo with a 200-word description of what’s happening and where it is. “Seal of Approval” profiles a celebrity in about 300 words. It’s written in a first-person as-told-to style as the celebrity describes four of their favorite things. Recent people profiled include news analyst and author Van Jones, describing his favorite comic book, TV series, sports team, and suit jacket, and chef and TV personality Anthony Bourdain, covering his favorite album, suitcase, cookware product, and shoe brand. There are about two uncategorized articles found in “Notebook” which usually take the form of a profile. Articles are 500 to 1,000 words long and can appear as third-person articles with quotes throughout or as structured Q&As. The tone is conversational and informal and sometimes more than one source is included in third-person articles. Examples from a recent issue include “Location is Everything,” which profiles movie location scout Alex Gladstone on defining moments in his career, and “Master of Form,” a Q&A with writer Thomas McGuane on his new story collection and life in Montana. There are three features per issue ranging from 2,000 to 4,000 words in length. The majority of these articles are written by freelancers in first- or third-person. Reporting on everything from a wave of tech-obsessed athletes and the decades-old career of actor Liam Neeson, to the pitfalls of sugar consumption and the perks of owning a dog, features tend to represent a mix of diverse, in-depth stories, which seek to explore something surprising or unknown about famous male figures or male-centric culture. In a recent issue, a 3,800-word feature profiled Doug Peacock, an author and naturalist who is avidly advocating for the preservation of grizzly bears in Montana. The article chronicled Peacock’s incredible history with the bears, highlighting why he is working to protect them before the federal government legalizes grizzly hunting. Another recent 4,000-word article looked into how one cult gear company is changing the face of big game hunting. Interweaving a mixture of interviews, research, and first-person scenes, the feature takes an immersive look into hunting as it transforms into the “next extreme sport.” In terms of format, features are almost always long-form stories, which incorporate a range of images, original illustrations, and pull-quotes. There are no sidebars. It’s also important to note that features are generally U.S.-centric, and the topics most commonly tend to involve athletes, outdoor characters, intriguing trends, male influencers, and ambitious journeys. “Gear Lab” is a section composed of six articles ranging from 200 to 600 words in length. More than half of the articles are written by freelancers in third person, and they almost always take the form of product roundups. Billing itself as “essentials for the well-equipped man,” this section is primarily devoted to active lifestyles, outdoor gear, fitness tools, and helpful adventure hacks. In a recent issue, “Gear Lab” explored the following products: blow-up paddle-boards, small-displacement motorcycles, lawn games, specialized camping gadgets, hammocks, and tennis rackets. Each article is usually broken up into several blurbs, which describe a particular product in detail. For example, a recent 400-word roundup compared voice-controlled smart-home command centers, such as Google Home and Amazon Echo. The piece was broken up into four blurbs, which detailed how to setup each system, what it’s like on a typical day, and why certain features are more helpful than others. Other roundups have compared where to go for online eyewear, what to pack for a big adventure, and what to wear in order to stay warm on camping trips. Text is generally accompanied by multiple images, and the occasional sidebar, which lists “tips” that coincide with certain products. “Workout of the Month” outlines a workout in 1,000 to 1,500 words. It’s written in a second-person instructional style and usually covers four to eight moves using the same piece of equipment. Quotes from trainers can sometimes be found throughout the piece. There are often several sidebars throughout the article including “Trainer Tip,” with a note from a trainer on tips to make the workout easier or more successful, and “Follow With,” which covers what to do after the prescribed workout, such as a run carrying the item used. Recent workouts include “Pack Your Sandbag,” which describes a workout with three moves using a sandbag, and “The Ball’s in Your Court,” covering an eight-move workout with a medicine ball. “Move of the Month” describes one particular workout move in detail. In about 300 words, the artice is written in a second-person instructional style and covers what the move is good for and how to do it. There is often a quote from a trainer or coach explaining why they like or recommend the move. Recent moves include a bottoms-up kettlebell press and a seated rope pull. “Advice” gives the reader information and advice on a health and fitness topic in 1,000 to 2,000 words. Articles are written in a conversational second-person style and include quotes throughout from experts on the topic being covered. There are often one or two sidebars to accompany the article which often appear as round ups of relevant products or apps related to the topic. Examples from recent issues include “Be a Goal-Getter,” which describes the best ways to set goals in fitness, career, and relationships and how to keep track of them, and “How to Train Your Sleep,” which covers strategies to improve your sleep such as changing your daily habits and your environment. “Do You Really Need This?” is a 300-to-500-word article which discusses products in the health and fitness world and whether they are really beneficial. They can be written in second or third person and use an informal and often humorous tone. Quotes from experts on the topic can sometimes be found throughout the piece. Recent examples include “Smart Scales,” covering high-tech scales and whether they can help with weight loss, and “Head-to-Toe Compression,” covering compression clothing and if it helps with athletic performance. “Nutrition” covers a different food each issue describing its nutritional benefits, where readers can find it, and how to cook it. Articles written in third person and are about 300 words long. They often include one or two quotes from an expert, such as a nutritionist. Recent nutrition articles include “Power Plant,” covering why readers should eat seaweed, and “Sea Worthy,” which covers the nutritional benefits of sardines. “Intel” rounds up news, events, and upcoming research in the health, fitness, and wellness world in about 800 words. There are about seven short articles covering one new item each, one of these is usually an “Ask the Expert” section in which an expert responds to a reader question. A recent example covers new research on high-altitude psychosis which can impact climbers, the fat-burning power of cinnamon, and a new book on meditation. There are about two uncategorized articles found in “The Blueprint” which can cover a range of health and fitness topics. Article run from 800 to 1,000 words long and can be written in a conversational second-person instructional style or as a third-person piece covering new research or a trend. Ocassionally, a profile is found of a well-known person. This appears as a first-person as-told-to style article as the celebrity covers their health and fitness routine and how this has changed over their life. Quotes from experts are sometimes included throughout the articles. Examples from recent issues include “The Case for Essential Amino Acids,” which covers new research into amino acid supplements for muscle growth, “Bobby Flay’s Fitness Revival,” an as-told-to article about the American chef’s fitness journey and healthy habits, and “Adult Swim,” which covers why readers should incorporate swimming into their workout routines with five tips on form, an example swim workout, and a round up of swimming products. *“The Last Word” is written by contributing editor Sean Woods and profiles a celebrity in about 600 words. This appears as a Q&A and covers a range of career and personal life questions. Pay rates: Writers have anonymously reported a rate of $0.30 per word for a 1,000-word piece (as of July 26, 2017). * Indicates a section written by a member of editorial staff or regular contributor.